Bond Brothers and Company traces its origin back to 1876. It began as a small family owned and operated printing business known as Dearborn Press. In 1919, the Bond family purchased Dearborn Press, then located on Dearborn Street in downtown Chicago. At the time of purchase, the name of the company was changed to the current one... Bond Brothers and Company. The company continued to do business in Chicago and its suburbs while employing many good men and women to carry on the work. It was in 1960 that Donald Jobb, after being employed at Bond Brothers for a period of time, had the opportunity to purchase the company. Over the years, Donald’s three sons joined the business in various capacities and the company grew and relocated to 161 West Harrison Street, Chicago; 600 West Van Buren Street, Chicago; and finally to its present location at 7826 West 47th Street, Lyons, Illinois. Bond Brothers and Company is now owned and operated by Donald’s three sons. 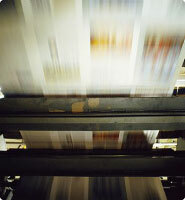 With their dedication and knowledge, Bond Brothers and Company continues to serve the printing needs of its customers.